Don't take it lightly... take it heavily. 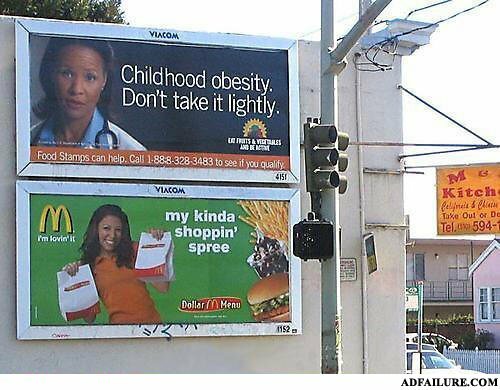 ChildHood Obesity -- Im Lovin It ! Kids, don't take obesity lightly, for a better lifestyle we recommend McDonalds. Is that the same woman? are those two the same? So many...Mixed messages....Questions. Why have you forsaken me, MacDonald? And for every dollar you spend at McDonald's, we donate- wait, nope, nevermind. "kind" means "child" in german.